I think the Kryptonite Kryptolok Series 2 Standard is a the best budget priced, standard sized, mid-security lock available today. 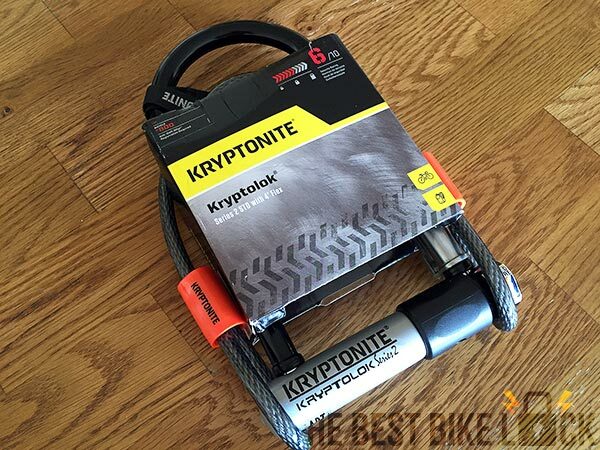 And in this review of the Kryptonite Kryptolok Series 2, I’ll look at how secure it is, how easy it is to carry and use, the optional anti-theft protection, and what alternatives are available. With a 13 mm hardened steel shackle, the Kryptolok should repel all but the biggest bolt cutters. The reinforced, hardened crossbar is pretty heavy duty and won’t be easily defeated by hammers or other brute force attacks. However, the steel used in the Kryptolok isn’t as high quality as that used in more expensive Kryptonite locks and the shackle isn’t double bolted. This means the Kryptolok will be more susceptible to cutting and leverage attacks. In terms of security ratings, Kryptonite themselves give it an in-house score of 6/10 which they define as “moderate”. 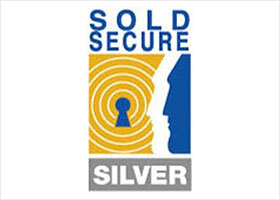 Of the independent lock testers, Sold Secure give it a very respectable Silver rating (from Bronze, Silver and Gold) while ART give it 2 stars (out of 5). All in all, the Kryptolok is a mid-security lock. It’s not a lock for expensive bikes in high risk areas. But for lower risk areas, more modest bikes and short stops it should offer more than enough protection. At 2.85 lb (1.29 kg) the Kryptolok isn’t the lightest of the budget priced U-locks, but it’s not super heavy. You could carry it in a bag on your back without too much discomfort. But a decent frame mount would be better. Firstly, it is difficult to attach to the bike frame. Secondly, once attached it doesn’t stay secure and slips down. Thirdly, it doesn’t hold the lock tightly enough. And fourthly, it is difficult to get the lock on and off the mount. Now some of these issues could be to do with people not installing it properly. Such problems can be alleviated by following one of the many online installation videos. And since it’s a universal bracket, some of the issues could be to do with specific bike frames. They won’t necessarily effect you. And don’t forget, there are other ways to carry your U-lock. You can put in a bag, attach it to your luggage rack, thread it through the seat rails or put it in a bike basket. Personally, I didn’t have any problems with the frame mount. I followed the instructions in this video and found installing the mount simple and straightforward. And while I was using it, the mount didn’t slip down and the lock didn’t work loose. Now, I was using it on a reasonably smooth commute. So it wasn’t subjected to too much stress! But if you are dependent on a frame mount, it needs to be reliable and there are just too many bad reviews of this bracket to ignore. So should this issue stop you buying this lock? No, that would be a shame. And since you get the same bracket with all Kryptonite U-locks it would also exclude all the other great locks from Kryptonite. My advice is this: if you like the lock, buy it and try the included frame bracket. If it doesn’t work for you, look at some of the third party frame brackets. You get two keys with the Kryptolok, which is not as many as with some other U-locks. However, the Kryptolok comes with Kryptonites Safe Key Program. Under this scheme, if you register your keys through their website, should you then loose them, Kryptonite will send you replacements. The Kryptolok also includes the Kryptonite trademarked “Bent Foot” design which I think makes it incredibly easy to use. The bent foot amounts to a small hook shape at the bottom of one arm of the shackle. In order to secure the shackle to the crossbar, you need to first hook the bent foot into correct hole in the crossbar. While this might seem an extra complication, in fact, the foot once hooked in, prevents that end of the shackle from slipping out, making the it much easier to finish locking the device. This version of the Kryptolok comes with a 4 ft long, 10 mm thick cable. And while I’ve already mentioned that this offers no practical security, I’ll also add that these cables are never easy to use! I find these cables a pain to thread through the wheels and difficult to attach to the U-lock. And how am I meant to carry it about? Am I supposed to thread it through the U-lock while its attached to the mount? If I do, it sticks out all over the place and gets in the way when I’m riding. I could put it in a bag but it tends to unravel and take up lots of room. And what if I don’t have a bag? For me these cables are just not worth the effort and in fact really I would consider buying this lock without the cable. People often complain about the locking mechanisms of U-locks stiffening up and becoming unusable over time. And while the Kryptolok has a rotating dust cover that will protect the locking cylinder from the worst of the weather, it’s not immune to this issue. However this is a problem that effects all U-locks and is more a case of poor maintenance and locking technique than a fault with the lock. If you clean and lubricate you lock regularly and make sure you fully insert your key before you turn it, this problem can usually be avoided. Unfortunately, for some people this just doesn’t seem to work and in extreme cases the key may break off in the lock. While this is obviously very bad, the good news is that should it happen to you, if you send Kryptonite the lock, the keys and any bill you incur when removing the lock, then they will replace the lock and refund the locksmith bill! Having said all this, I’ve used the Kryptolok Series 2 as my day to day lock for over two years now and have never had this problem. The lock is left outside day and night in all weathers and I have never cleaned or lubricated it and yet it continues to perform perfectly! The Kryptolok is eligible for coverage by Kryptonites own Anti-Theft Program. If you register for this program and your bike is stolen as a result of your lock being broken, Kryptonite will pay you the lesser amount of either a) the cost of your bike or b) your insurance deductible. The amount they are willing to pay has an upper limit depending on the security level of the lock. In the case of this lock it is up to $1500 or £800. So if you register for the program and your bike gets stolen through this lock being broken, then Kryptonite will pay you up to $1500 or £800. Sounds great eh? Well it is, but Kryptonite impose lot of conditions that you need to be aware of and which in some cases may make a successful claim impossible. First of all you need to register for this program within 15 days of purchasing the lock. And it’s not free. In the case of this lock it’s $10 for 1 year, $15 for 2 years and $20 for 3 years. Failure to complete any of these steps will invalidate your claim. In practice the biggest problem for many people seems to be the requirement that you provide the broken lock. Often when a bike is stolen, there is no sign of the compromised lock, but if you don’t provide it you won’t get your money. However if you are able to provide everything they ask for then Kryptonite do pay out. This sort of anti-theft protection is not an adequate replacement for either homeowners/renters insurance or specialized bike insurance though, both of which offer far more extensive and reliable cover! The Kryptonite Kryptolok Series 2 is the classic U-lock. It is strong enough to defeat most thieves without being too heavy or expensive. It’s easy to use. And it entitles you to Kryptonites high level of customer service regarding lost or broken keys. What’s more, as long as you’re able to fulfill the requirements, Kryptonite provide you with a decent level of financial reimbursement should your bike be stolen as a result of this lock being compromised. However, this lock is breakable with hand tools. The bigger bolt cutters will be able to cut through the shackle. It is not double locked, so a thief only has to cut through one side of the shackle to remove the lock. And the frame mount should be much better than it is. 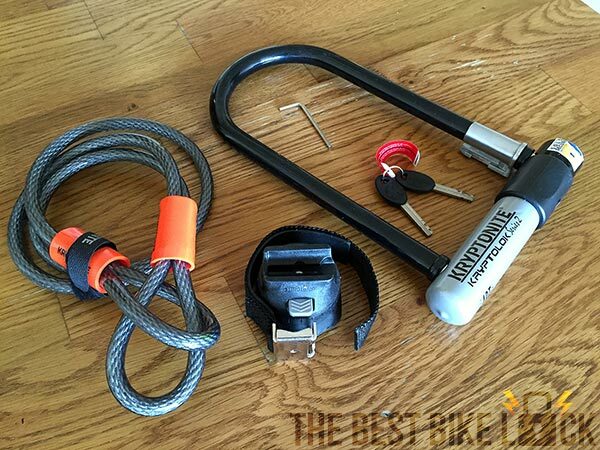 But overall this is a great budget U-lock. 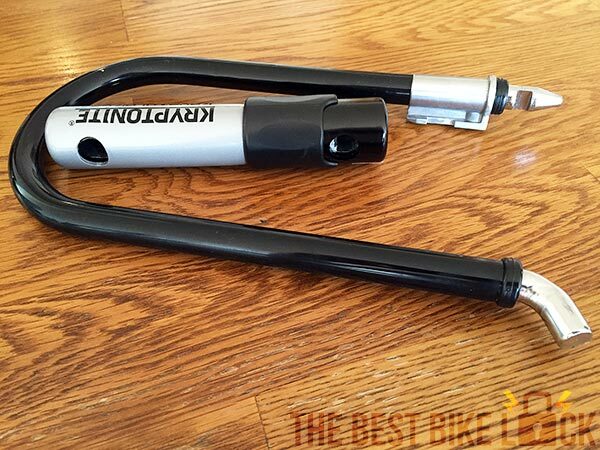 If you have a low value bike or live in a low theft area, then this could be the best bike lock for you. If on the other hand, you have a bike that people covet, a bike that might turn the head of a serious bike thief, then you might want to look at a more secure, more expensive lock. The Kryptonite Evolution Series 4 Standard is the next model up from the Kryptolok Series 2. The shackle is 1 mm thicker and is made from a different, MAX-Performance steel. And it’s also double bolted which means a thief would need to cut it twice to defeat it. This makes it a very secure lock. In fact it’s rated Gold by Sold Secure and ART give it 3/5 stars. It’s about 50 g heavier and a little bit more expensive than the Kryptolok. But not much. And for me, the security boost more than makes up for the extra weight and the price difference. So if you looking for a U-lock that’s the same size as the Kryptolok but offers a much higher level of protection, this is a very good choice. The Bulldog DT is OnGuards version of the Kryptolok. Just like the Kryptolok, it has a 13 mm shackle and a Sold Secure Silver security rating. However it’s almost 25% cheaper. And it’s lighter. And the frame mount may be a little bit better. Just don’t expect the same level of after sales customer service you get from Kryptonite. Looking for a better frame mount? The Cocoweb Armbar is a relatively new, budget priced U-lock. 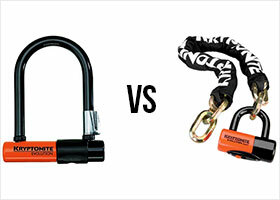 It’s a heavy duty lock with a 14 mm shackle but is cheaper than both the Kryptolok and the Bulldog. And it also has a very robust and popular frame mount. However there is no after sales customer service at all with this lock. No replacement keys, no anti-theft protection, nothing. Have a look at our full review of the Cocoweb Armbar. And see how it compares to loads of other U-locks. 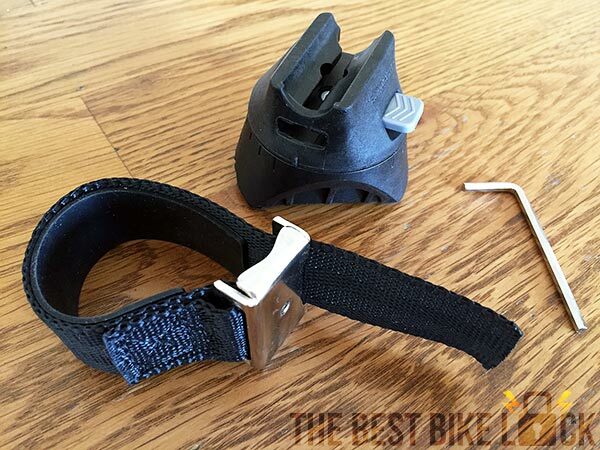 If none of these budget U-locks appeal to you, this guide will show you the 3 straightforward steps that guarantee you’ll find the right lock for your bike. Thanks for the review,it’s nicely done and useful – but in your specs summary, you say the weight is 1.29kg. Then in the actual article you say it is 1.6kg. This is quite a substantial difference; which is the correct figure please? You say the Bulldog DT is lighter, but if your lower figure is correct, is this still true? Would genuinely appreciate clarity on this. Sincere thanks for your assistance. It’s 1.29 kg. Thanks for spotting that, I’ve just corrected the article. And it’s still heavier than the Bulldog which is 1.10 kg. I’ve owned both of these locks and you can definitely notice the difference in weight. I recently bough a Kryponite lock for my daughter at University in London. 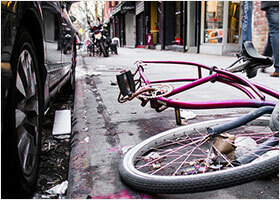 Despite locking the bike correctly the lock was broken open and the bike stolen within a week. These things happen so I emailed Kryptonite with photos of the twisted and burst lock in situ. One week later they have not even bothered to reply. My advice is to treat with caution they are not as strong as the name suggests and so far customer service is non existant..
Oh no, that’s disappointing Andrew. If it was this lock, (the Kryptolok Series 2) then I would say then it’s not really secure enough for London streets. You should always go for a Sold Secure Gold lock in London. Whether Kryptonite or any other brand. But besides that, I’m really disappointed to hear that Kryptonite haven’t acknowledged your email. This Kryptonite is actually a terrible lock, Ive had 4 of them and they all stick immediately, eventually locking up the bike and requiring them to be cut off. Their customer service is horrendous, it has taken 2 months to get a new correct lock from them after mine was broken and they agreed to replace it. As well, they never refunded me for the locksmith charges, the lock smith which KRYPTONITE suggested I call and assured me I would be refunded. Absolutely horrible company to deal with, takes 1-2 weeks to respond to an email, the phone service is equally bad. Mmm sounds like you’ve had a terrible experience John! All I can say is: I’ve used this lock every day for the last 3 or 4 years and mine has never stuck. I know that pretty soon I’ll need to give the ends of the shackle a bit of a de-rusting and some grease. But I reckon my lock’s got years in it yet! Do you live in a particularly harsh climate? Really wet, cold or salty? As for the customer service, that surprises me. As I’ve never had any problems with my lock, I’ve never had any need to contact them. But I’ve heard good things from other people, especially compared to other lock brands. I hope you persevere with the lock smith charges. And good luck! All of the new locks they sent me immediately were sticking similar to my old one which eventually wouldn’t open at all , I’m talking first couple try’s out of the box , they were sticking . And I typically keep my bike inside , except when I’m at work or something , and no unusual climate here . I’ve worked in customer service for years , and the way they handle things on the phone with me was horrible . Online they take weeks to answer and the reimbursement I was given was a rewards card , not actual money ,check, or debit . It has stipulations and automatically applies gratuity if possible , oh , and it doesn’t work anyway and they refuse to just write me a check . Can you do a review on the updated double bolt version of this lock? Yes i want to see a review of the new u. New kryptoflex lock never been wet , no time to rust, kept inside, is jammed shut. Can I even trust a replacement? Have you tried the suggestions here Sharon?